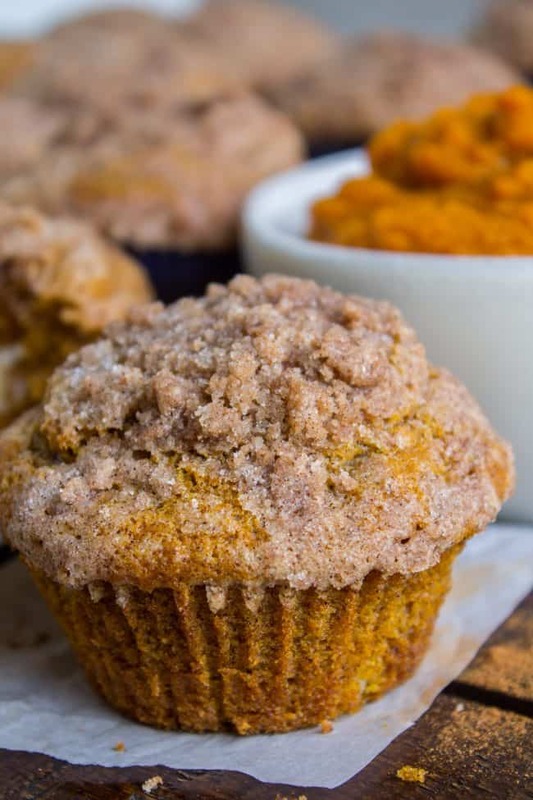 There is no better way to welcome fall than with these Pumpkin Cream Cheese Muffins! 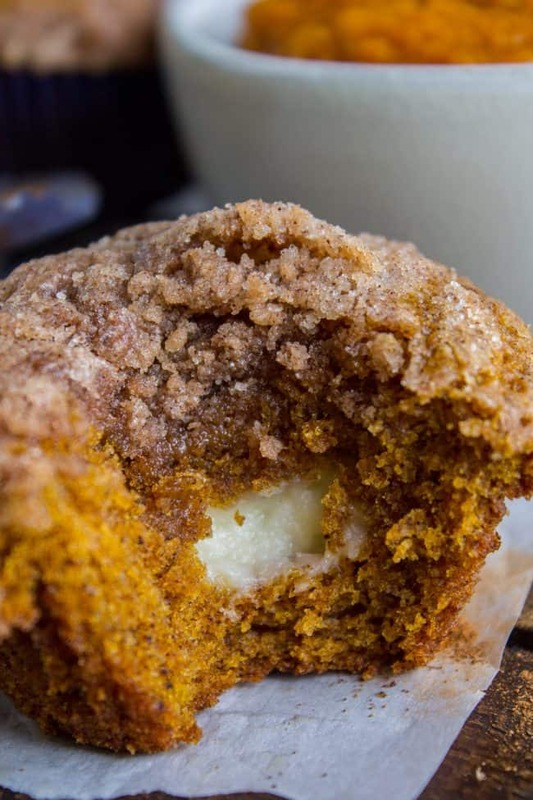 A moist, tender, ultra pumpkin-y muffin, filled with sweetened cream cheese, and topped with cinnamon sugar crunch topping! They are irresistible! If it’s too hot where you are, these muffins are guaranteed to make the leaves start falling off your trees. 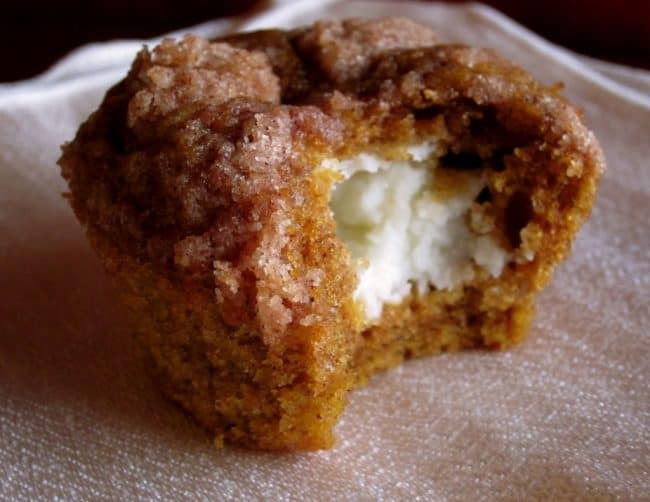 This post for Pumpkin Cream Cheese Muffins was originally published on November 10, 2011. New photos and muffin baking tips were added on September 21, 2018. And so a Star Wars marathon ensued. Every week or so we would get a bunch of food and people together and watch the movies, starting with the classics of course. I’ve seen those movies a dozen times at least, but I can’t tell you how awesome it was to watch someone else watch it for the first time. A few weeks ago we introduced Huy to The Princess Bride. I guess he didn’t know it was supposed to be funny, because while I was cracking up and quoting lines (Anybody want a peanut?) he was just watching, stony faced, waiting for the story to pick up. Maybe if I didn’t have so many memories attached to movies from my childhood I wouldn’t think they were so great. Once we were having a family party for someone’s birthday. My brother Nathan was about 4 or 5 I think, and he was sword fighting with my cousin. Nathan was Inigo, Tony was Count Rugen. There must have been a lull in the conversation, because everyone in the room heard Nate deliver his final line: I want my father back, you son of a–! Except he really said it, as he slashed Tony through the armpit. Try explaining to a 4 year old that even though 25 people just erupted in laughter, it is not appropriate to use that kind of language. I digress. Back to the food. 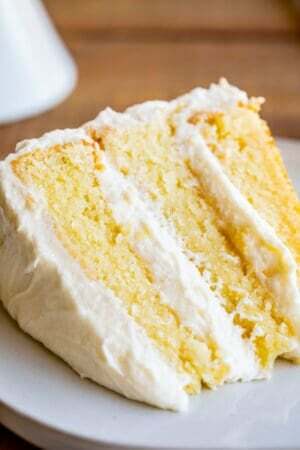 I think pretty much any dessert could be made 10 times better by adding a cream cheese filling or layer. Cupcakes? Check. Pie? Check. French Toast Casserole? Check. 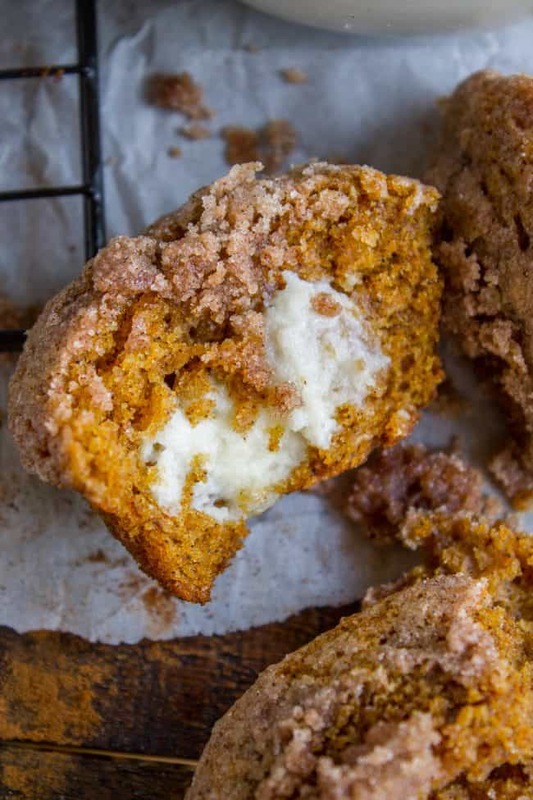 These pumpkin cream cheese muffins? Double check. Tender, super tall muffin, with sweetened cream cheese in the middle means there is never a boring bite. And of COURSE there’s streusel on top. Seriously what is the point of a muffin without streusel? This recipe makes 24 pumpkin cream cheese muffins, and since it is just me, Eric, and wee little Charlotte (who has yet to taste any dessert) I decided to leave a few out and put the rest in the freezer for later. Apparently that was a mistake because they were gone within 3 days. Spray the top of your muffin pan with nonstick spray so the muffin top will pop out easily. Fill the muffin batter almost to the top of the muffin liner. Yes, really. Trust me! Bake at a super high temperature (425 F) for 5-6 minutes until the muffins have risen over the top of the pan. Then lower the temperature to 350 without opening the oven door and finish baking. Pop the muffins out of the pan 1-2 minutes after removing from the oven (yes, when they are burning hot) so that the bottoms don’t get soggy. That’s it! You can use these rules with basically any muffin batter. The high temperature to start is the key to tall fluffy muffins. Here is my original photo of these muffins, taken back in November 2011. This was one of the first recipes I posted on my blog! It’s a winner guys! Four years ago: Blackberry Cake with Coconut Cream Cheese Frosting << all time favorite. 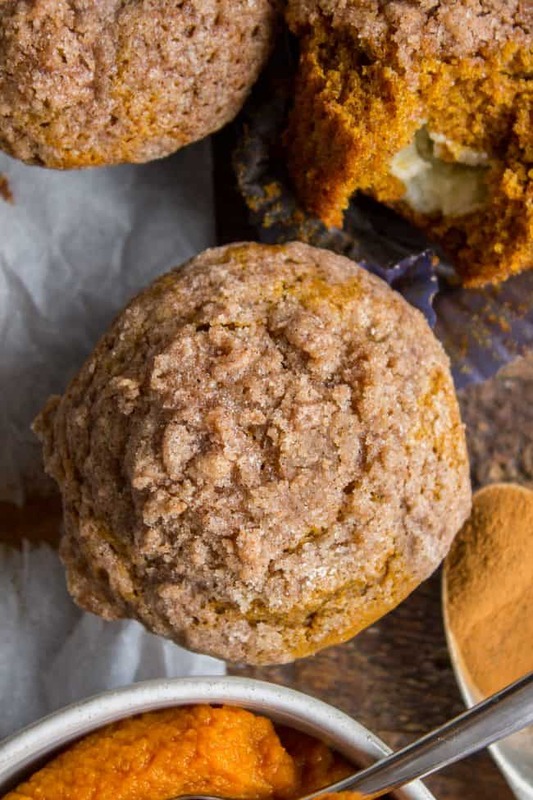 There is no better way to welcome fall than with these Pumpkin Cream Cheese Muffins! 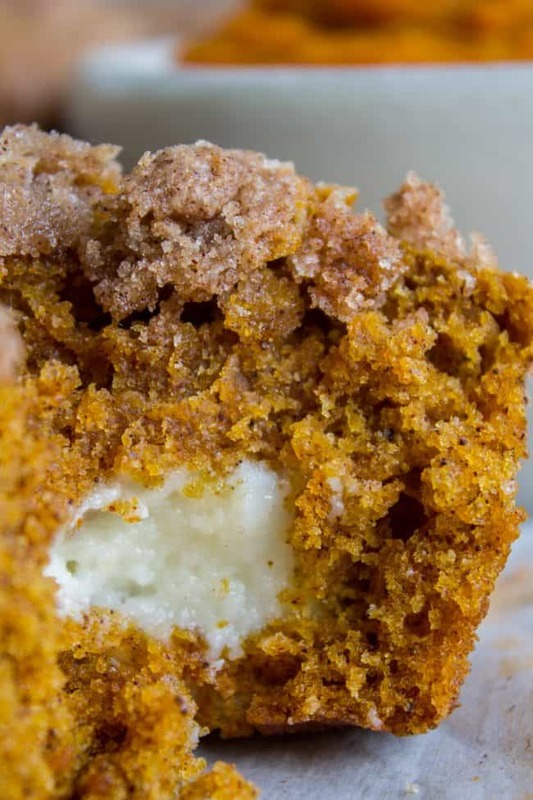 A moist, tender, ultra pumpkin-y muffin, filled with sweetened cream cheese, and topped with cinnamon sugar crunch topping! They are irresistible! If it's too hot where you are, these muffins are guaranteed to make the leaves start falling off your trees. In a large bowl or stand mixer, beat together the cream cheese and powdered sugar on medium speed until blended and smooth. Make sure to scrape the sides and bottom. Lay out a large piece of plastic wrap. 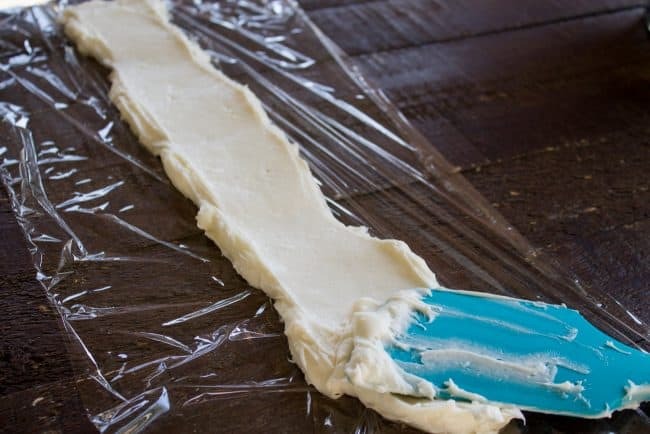 Use a spatula to transfer the cream cheese mixture onto the plastic wrap in a log shape, about 1 and 1/2 inches in diameter. Smooth the plastic wrap tightly around the log, sealing the ends well. You can reinforce with more plastic wrap or foil if you want. Transfer to the freezer and chill at least 2 hours, or overnight. You want the cream cheese log to be firm enough to slice. Fill each tin with paper cupcake liners. In a large bowl or stand mixer, beat the eggs until blended. Add 2 cups sugar, the pumpkin puree and the oil. Mix on medium-low speed until blended, scraping the sides and bottom if necessary. Add 3 cups of spooned and leveled flour, but do not mix it in yet. Make a small well in the flour, and add the cinnamon, nutmeg, cloves, pumpkin pie spice, salt and baking soda. Use a small spoon to stir it into a flour a bit. Use a large spatula to mix the wet and dry ingredients together. You can use the mixer if you want, just be very careful not to over mix. Only stir until the flour has barely been incorporated. Make sure there are no liquid-y parts, and remember to scrape the sides and bottom well. Cover and put the muffin batter into the fridge to rest for about 20 minutes. Time to make the crumb topping. 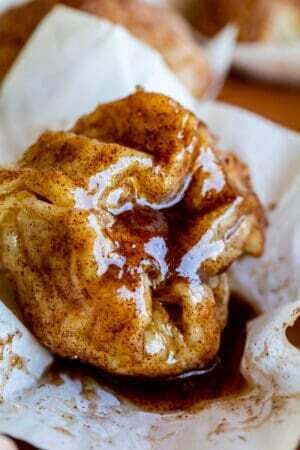 In a medium bowl, combine 1/2 cup plus 2 tablespoons white sugar, 1/3 cup flour and 2 teaspoons cinnamon; whisk to blend. Add in the cold butter pieces and cut into the dry ingredients with a pastry blender or a fork until the mixture is coarse and crumbly. 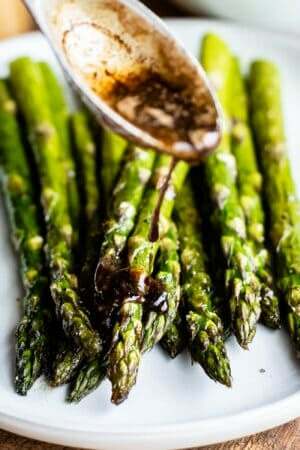 You could also use your hands to incorporate the butter. The mixture should look like coarse sand with pea-size chunks of butter throughout. To assemble the muffins, fill each muffin well with a tablespoon of chilled batter, just enough to cover the bottom of the liner. Slice the log of frozen cream cheese filling into 24 equal pieces. Place a slice of the cream cheese mixture into each muffin well. Divide the remaining batter among the muffin cups. Fill the batter nearly to the top of the liner; there should only be between 1/4 and 1/8 inch of space at the top. Sprinkle about a tablespoon of the crumb topping over each muffin. Chill the assembled muffins if there is any time lapse before you bake. Bake for 6 minutes at 425 degrees. After 6 minutes, without opening the oven door, turn on your oven light and look at the muffins. They should have risen about 1/4 inch above the edge of pan by now. If not, leave them in 1 minute longer at 425. Once the muffins have puffed over the edge of the pan, lower the temperature to 350 degrees F. DO NOT OPEN THE OVEN DOOR! Seriously. Once you have lowered the heat to 350, bake for another 13-15 minutes. The muffins should not be shiny in the center, and a toothpick inserted should come out with no wet batter on it. Remove from the oven and place on a wire rack to cool for 2 minutes. Use a butter knife to help loosen the edges of the muffins, and remove to a wire rack to cool. I know they are still very hot after 2 minutes, but taking them out of the pan right away will keep the muffins from getting soggy. Eat one muffin as soon as humanly possible considering how hot they are, then let the rest cool completely on the wire rack. Store covered on the fridge for 1-2 days, after that refrigerate them. These muffins (and all muffins!) freeze very well. Once cool, place in a ziplock bag and freeze for up to 2-3 months. Let thaw in the closed bag on the counter. Warm up in the microwave for 10-20 seconds to live your best life. 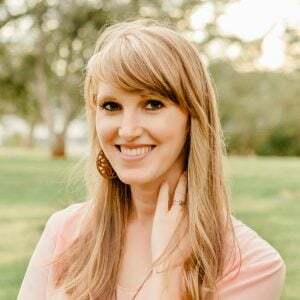 I found this recipe in 2011 on one of my favorite blogs, The Girl Who Ate Everything. She got the recipe from Annie's Eats, who got the recipe from Bakespace. It is well-loved! 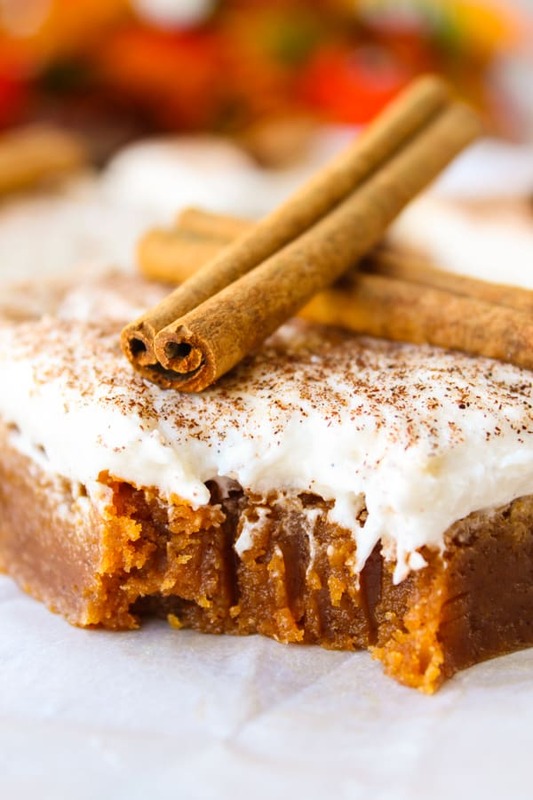 Here are some other pumpkin recipes you will love! 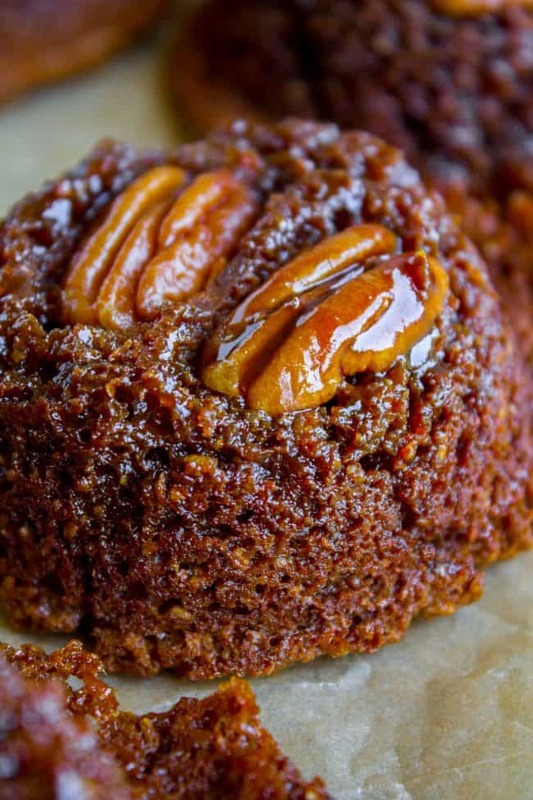 Easy Pumpkin Pie Cake << It’s like all the best parts about pumpkin pie…in cake form. Plus it’s EASY to boot. Butterscotch Pumpkin Cake << I call this a cake, but it barely qualifies. It’s got more of a brownie texture. IT’S SO GOOD. Personal fav. 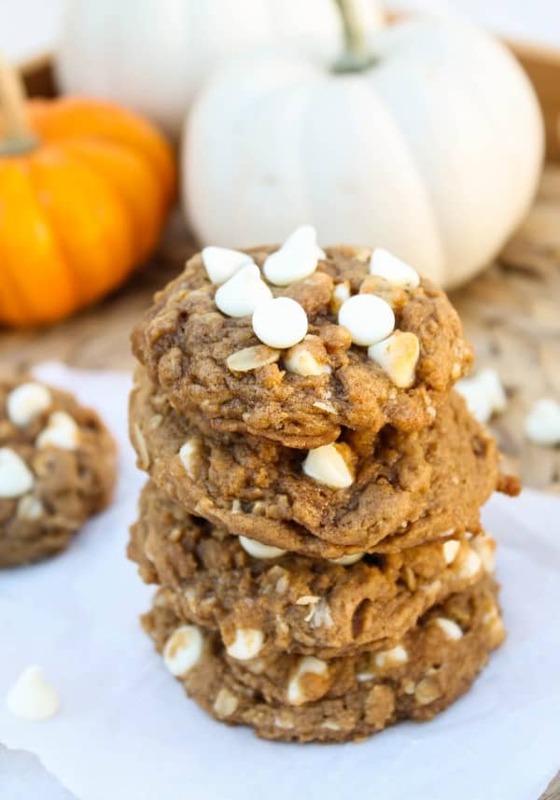 Pumpkin Oatmeal White Chocolate Chip Cookies << this is my first blog post ever! Good times. GOOD COOKIES. oh yeah. If you’re looking for more show stopper muffins, try these Bran Muffins with Buttery Molasses Glaze. They are seriously amazing. More muffins from friends you will love! I made this muffins a couple months ago and they were such a hit that I’ve made 4-5 batches since then! My Mom even requested that I make them and she took them to a work potluck! These freeze well and I think they might even come out more moist. Great recipe! It’s a keeper! So happy to hear that Twila!! Thanks for reviewing! Delicious. These muffins are a big hit with everyone that tasted them. The first time I made them, I did not place the cream cheese log in the freezer long enough. I read the recipe through a number of times, but somehow missed the part of freezing them until firm. I took them to share at cards, stored some in the freezer and served to company during the Thanksgiving holidays. So perfect!! I am about to make another batch today. I’m so glad you liked the muffins Terry! They are definitely company-worthy! :) Thanks for coming back to comment! I made this recipe and substituted ricotta for the cream cheese as I didn’t have any cream cheese. I also used pureed pumpkin from the pumpkins I carved for Hallowe’en. It turned out really light and delicious. This is a keeper as I will be using it again. Live in England and prior to kids, I travelled to the US a lot. Pumpkins cream cheese muffins were one of my guilty pleasures! Although I had to improvise the pumpkin spice mix am pretty pleased with these!! No pumpkin spice muffins in the coffee shops in England? You need to tell them our secret! ;) I’m so glad you liked the recipe Victoria! Thanks for the comment! All the cream cheese filling oozed out the top. What did I do wrong? Hey Brooke! I’m sorry to hear that! The cheesecake filling rises in the oven, so it needs to be put in pretty low to begin with. I’m wondering if you just filled the muffin tin with too much batter before adding the cheesecake filling? You only need about a tablespoon of batter on the bottom. Oh My!!! Your recipes never fail. These are the absolute bomb. I made them 48 of them for a ladies retreat…they are you going to love them…though truth me told only 44 are making it to the retreat because my better half couldn’t keep his hands off em. OMG I should have made two batches they did not even last for me to take one home! They were super delish! Of course they did not look as pretty and my crumble on top didn’t turn out like the picture and the cream cheese middle didn’t harden up fully but man O man they were so very good. My son doesn’t like pumpkin and he ate two so I would say they were a success. I’m so glad you and your son liked them Kelly! These muffins freeze so well, it is tempting to double the batch, right? (48 muffins is not at all excessive, come on now ;) Thank you so much for your feedback, I love hearing from you! Hooray for fall baking! 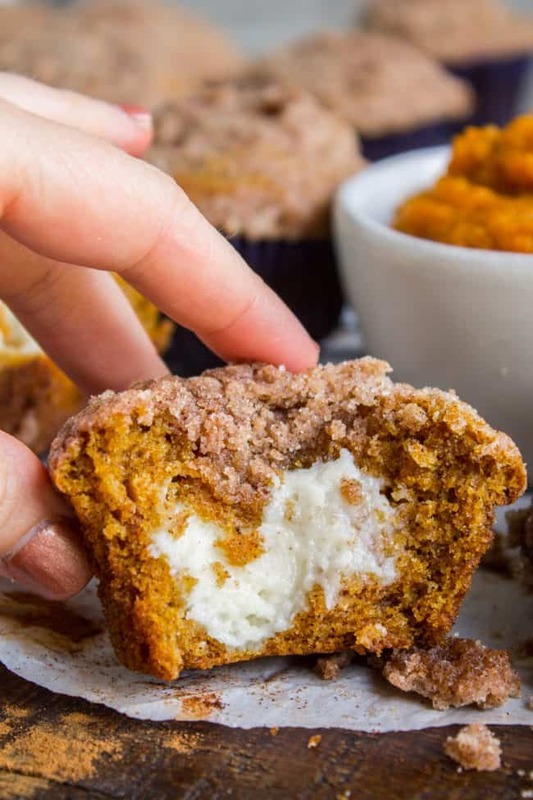 It looks like wrote to add the flour twice in your cream cheese pumpkin muffins. Ah thanks for catching that Jacqueline! I will fix it! So beautiful creation for the best time of year ! Thank you so much ! These look and sound delish. Step 23 is my favorite. Haha thanks Allison! Let’s be real, who’s gonna make muffins and not eat one hot ;) Hope you get to try them soon! Haha it is hard to stop once you start! Thanks! How about a direct way to print the recipe? There are far too many ads on your page. Hey Tanya! That’s annoying. I’ll check with my ad provider to see if they can get rid of it for printing! Thanks for the feedback! I have been craving these for months. Yet, since it is like still 110 degrees every day here in Del Rio, I have been telling myself, “No, wait little Sarah, be patient and your muffin time will come.” NO! I WILL WAIT NO LONGER! It is back-to-school time and I am making these NOW! 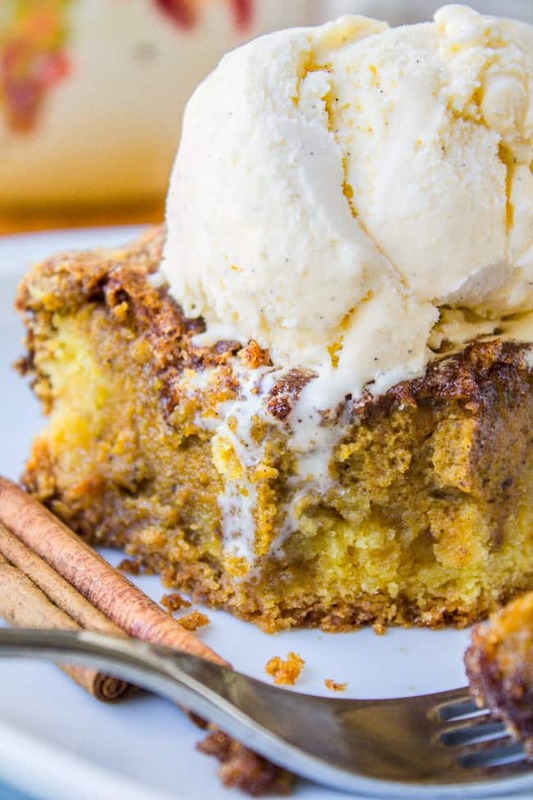 The moment September hits, all pumpkin desserts are totally acceptable. Right?? i need to invest in a case of pumpkin, evidently! 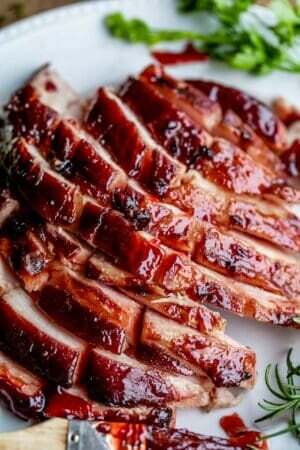 can’t wait to have you here for awhile to cook for me. what, you thought i was going to cook? and that ‘fight’ between nate and tony? one of my best memories ever! That cracked me up. I have all the stuff for these muffins! Too bad I am starving myself to recover from an especially glutinous halloween. Karen, you tell the best stories. I love this blog. You are so wonderful and I’m so lucky Eric married you. Another talented woman in the family.